Dan Brown's historical thrillers seem to be one of those fads, where everyone is talking about it and nobody is really sure why. Looking back on his previous novels, especially those featuring the mild-mannered Harvard professor Robert Langdon, it becomes increasingly unclear why Brown has been able to keep the blockbusters coming. The Da Vinci Code definitely captured the public imagination, but not with graceful storytelling and intrigue. Instead it boldly presented a bunch of outlandish old-wives tales as fact and dragged readers through exposition after exposition. After The Da Vinci Code (and it's insufferable yet inevitable film version) came The Lost Symbol, a novel with no particular plot other than what amounted to a mediocre treasure hunt. As you would imagine, Robert Langdon is here for at least one more outing. Brown seems to have wanted to mix things up a little from previous works, mostly for the better. In the beginning, Langdon wakes up with a bullet wound and short term amnesia. A murderous sociopath is on his tail. A chase ensues. Most of this is very standard procedure, however some parts do seem to underline the writer's new found flair for comedy and witty quips. The plot revolves around Dante's famous Divine Comedy and Inferno, which are being used by an unhinged scientist as... well nothing really. 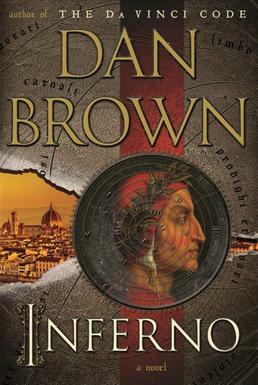 Inferno is mostly Langdon's guide to solving the series of mysteries separating him from whatever mad invention Zobrist, the scientist, had left hidden before his suicide. As I mentioned, there is nothing new here for people familiar with either Florence or the original Inferno, at least in terms historical background and literature. If you want to acquaint yourself with Dante in a more meaningful (but just as fictional) way, I would suggest Dante Club by Matthew Pearl. The best part here is seeing Mr. Brown warp our expectations towards the end of the second act. Much of the intrigue at the end is more about things that seemed mundane in the beginning. There are quite a few clever twists that do keep the pace up even towards the end, when I was feeling a bit overwhelmed by the encyclopedean expose. Oh, and the ending did catch me off guard. Consider yourself warned, it may not be good literature, but Inferno does sometimes surprise and excite.